“Yeah, I’m ageing some Orval at the moment.” It sounds quite technical, perhaps even daring. But ultimately, ageing beer is simply resisting the urge to drink them straight away. All beers age if they aren’t drunk. They oxidize, and most beers will start to taste stale and papery after their best before date. But some beers age in interesting ways, and even attributes like oxidation can come through positively if they’re in a beer that’s complex enough to work with them. 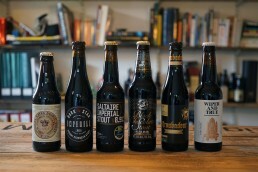 Choose strong styles such as barley wines, imperial stouts or Trappist ales. If they’re bottle conditioned this will help, as the slow production of carbon dioxide from the secondary fermentation will slow oxidation. But beers age in other ways too so any strong, complex beer is worth a go. Store in a cool, dark place such as a cupboard, or, if you’re lucky enough, a cellar. Warm areas age beers faster. 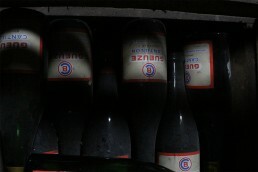 Unlike wine, beer bottles should be stored upright, so the beer doesn’t come into contact with the cap. The first change in ageing beers is that the strong, hoppy character breaks down. If you want to drink a juicy IPA at its best, drink fresh and store chilled at all times. When it came to brewing Cannonball, we wanted to brew a US West Coast style IPA because it was our (me and brewery founder Rich) favourite style and we had found that the imported beers had usually lost some of their hop character by the time they reached the UK. We wanted to make a modern IPA which would taste like the IPAs we had tasted fresh at the breweries over there. We have been brewing Cannonball since day one! It was our first brew and the recipe has been perfected over time and we have got to a point where we are very happy with the way we brew the beer. We use British grown Golden Promise pale ale malt for the base with a small amount of Vienna malt, we want high attenuation from the mash so that we get a very dry light body in the beer so that hops are able to shine through. We use a hop back full of whole hops after the boil; the dry hopping is the most important part of the process in this beer. The hops are Centennial, Columbus, Citra, Amarillo and Simcoe. As for inspiration, this came from Pliny the Elder, Ballast Point’s Sculpin and Port Brewing Mongo IIPA and Wipe Out IPA. One last thing: always drink Cannonball FRESH!! Ladies and gentlemen, please stand, an imperial stout has just walked into the room, a beer of gravitas and history and heritage, a muscular beer with a heft and weight that would bode well if it ever wanted to work as a circus strongman or woman. This is a beer that is ideal for contemplation, a brewing deal struck with the devil perhaps, a beer that, like IPA, was thought to be buried in the archives of history 30 years ago, and again like IPA it has sprung back to life, with the vivacity of a desert flower after the rains. In the 19th century, it was oh so different, imperial stouts (perhaps masquerading under the name of Double or Extra Stout) were a common part of many a brewery’s portfolio, strong and expansive sipping beers. Then after World War I had decimated the British brewing industry in more ways than one, they declined and by the 1980s Courage Russian Imperial Stout was near enough all on its lonesome. 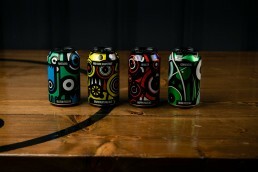 In 1998, five years after it was last brewed, the then owners of the brand, Scottish & Newcastle, announced the end of the beer – in 2011, the beer was brewed by Charles Wells of Bedford, and there have been several vintages brewed since, though at the time of writing the beer seems to have vanished off the radar. Mind you, elsewhere the imperial stout is a healthy monster, a bold statement by many a brewery, large and small, throughout the world, in North and South America, in Europe, and of course in its British homeland, a demonstration that they’re not afraid of alcohol and heady dark malts. Though sometimes if you want an imperial stout you might find yourself flummoxed as I was during a recent trip to a Mikkeller bar in Copenhagen. I wanted was an imperial stout, but instead I was offered one fermented with Sahti yeast and another one that had cake mix and biscotti. I didn’t know whether to cry or raise a glass to such questionable ingenuity. The imperial stout has come a long way since its gaslit origins and I suspect it will keep on travelling. Brutal in its darkness, coffee, chocolate, dark fruit, figs and Demerara sugar, alongside an appetising roastiness and subtle hint of Brett. A boozy stew of dark plum and currant on the nose, alongside espresso and almond liqueur; coffee, chocolate, more dark fruit, a cosy creaminess and a slight hop bitterness round things off. Intense roastiness on the nose alongside a softer zephyr of chocolate, mocha and dark fruit; rich and roasty on the palate with a dry finish. If you want an alternative to Sambuca then this is it; it is spirituous, rich and mocha-like in a glass, Herculean in its reach on the palate, a destroyer of worlds and perfect for ageing. Roast barley reaches out from the glass, alongside an arch of mocha, chocolate and toffee; the same characters tread the boards of the palate, while the finish is bracingly bitter. Hard Shake is the ‘imperial’ version of Wiper and True’s superb Milk Shake milk stout and is loaded with chocolate malts, vanilla and the addition of cacao nibs. It’s sweetly smooth and willingly warming for winter nights.